Last year when Rickey Gadson, drag racer and Kawasaki test rider, told us to be prepared for Kawasaki to blow our socks off, we knew there was something big in the works. For something to blow away the phenomenal ZX1400 and impress one of the fastest riders in the world, it would have to be really good, but we didn't expect this. If the super sharp looks of the Kawasaki Ninja H2R won't get you salivating then the claimed power figures will certainly have you running for cover. There's a claimed 300PS on tap from this supercharged four cylinder rocket. This manic Ninja gets its name from the equally bonkers (for it's time) H2 750cc two stroke triple from the 70s that set new standards for insanity on two wheels. It may be a four stroke now but it's that supercharger bolted on to the 1,000cc four cylinder motor that robs this motorcycle of its sanity and places a joker like grin on our faces. Kawasaki has pooled in expertise from its heavy industries division that has specialised in gas turbine technology and its aerospace division to develop the supercharger completely in-house. The bodywork matches the insanity of the motor managing to be sharper than a stealth fighter with aerodynamic wings sticking out all over the place for 'high speed stability' while the chassis features a new steel trellis frame rather than the standard aluminium cradle frame on its other Ninja siblings and a single sided swing arm - a complete 'standout from the crowd' overkill. 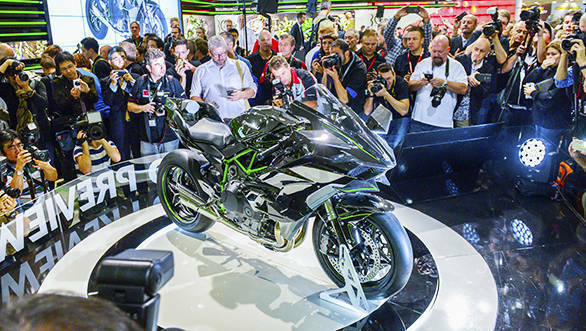 Kawasaki says that the Ninja H2R will be a production motorcycle for closed circuits only, and you won't be able to register one for use on public roads. And in Kawasaki's own words, it's "a showcase of craftsmanship, build quality and superb fit and finish" that the company is capable of. We'll now have to wait till EICMA in the first week of November to see what their interpretation of a fully street legal version of pure insanity is. Still since this is a production motorcycle and not a concept, there is a chance we just might get to ride one some day (cue - evil villainous laughter).